The simple sound of a hair dryer is well known for calming restless tired babies and helping them to relax and fall to sleep. When your baby needs to hear that familiar comforting sound, you no longer need to reach for the real hair dryer. Why waste all that energy when there is a much easier method of providing the same baby soothing sounds. Our Sleep Sound Baby Hair Dryer sound provides all the benefits of listening to the real hair dryer but without all the hassles. We have digitally captured the true sound of a hair dryer to provide a high quality environment changing recording. Additionally, as you play the sound, you can individually alter the volume and tone settings to provide the exact level to suit your requirements. 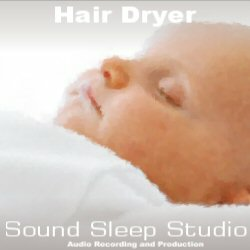 Hair Dryer is available as a simple MP3 download. The MP3 can be played directly from your computer or via any MP3 player. You can be playing this soothing sound to your baby in just a few minutes and provide that comforting sound at the touch of a button.